As part of its Digi Dhan Mela initiative to strive towards a Digital Economy in India, the Prime Minister Narendra Modi has now launched the BHIM app to simplify online payments. The National Payment Corporation of India (NCPI) has announced the launch of the BHIM (Bharat Interface for Money) app for cashless mobile payments. The app is interoperable with Unified Payment Interface (UPI) and the bank accounts besides having provision for USSD (Unstructured Supplementary Service Data). The key highlight of the BHIM app is the extremely simplified and easy to use interface. The app, which measures just 2 MB, is currently available in English and Hindi languages. The app can be used to send and receive money using the mobile number or the virtual payment address (VPA). 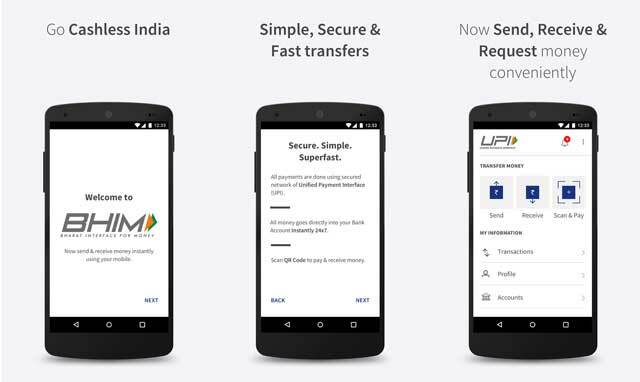 To register on the BHIM app, users need to choose the mobile number linked to the bank account and then set a UPI PIN for the account. By default the virtual payment address (VPA) would be the mobilenumber@upi but can be later customized to name@upi. The service, which aims to replace cash and even the plastic cards, does away with the requirement of internet access or even a smartphone for transaction. At the merchant location, users need to just feed the Aadhaar number and select the bank account. The user can then authenticate the payment using the biometric scanner.